Patrick Comins is executive director of the Connecticut Audubon Society. He is a graduate of Trinity College in Hartford and has worked in the bird conservation field for over 20 years. 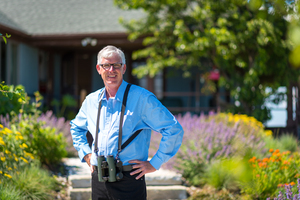 Patrick began his career with the Connecticut Audubon Society undertaking bird surveys at theMcKinney National Wildlife Refuge, and served as the director of bird conservation for Audubon Connecticut for nearly 17 years before coming to the Connecticut Audubon Society.